AnswerLine offers information and resources for consumers with home and family questions in Minnesota and other states in the Midwest. Iowa State University Extension and Outreach staffs and manages this program. They are the welcoming 'front door' to Extension. 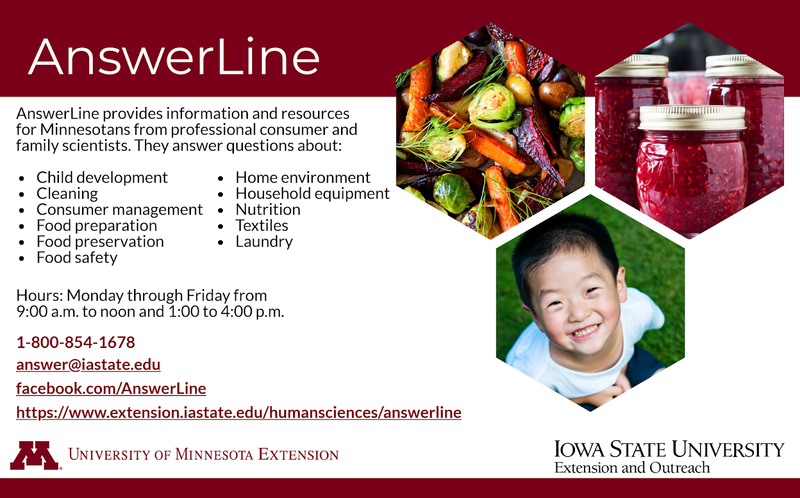 The AnswerLine team is available 9:00 a.m. to noon and 1:00 to 4:00 p.m. to answer questions for callers from Minnesota. Call 1-800-854-1678, email answer@iastate.edu or comment on their Facebook page.